Brief: This plugin has been deprecated. For future versions and updates, please go here. 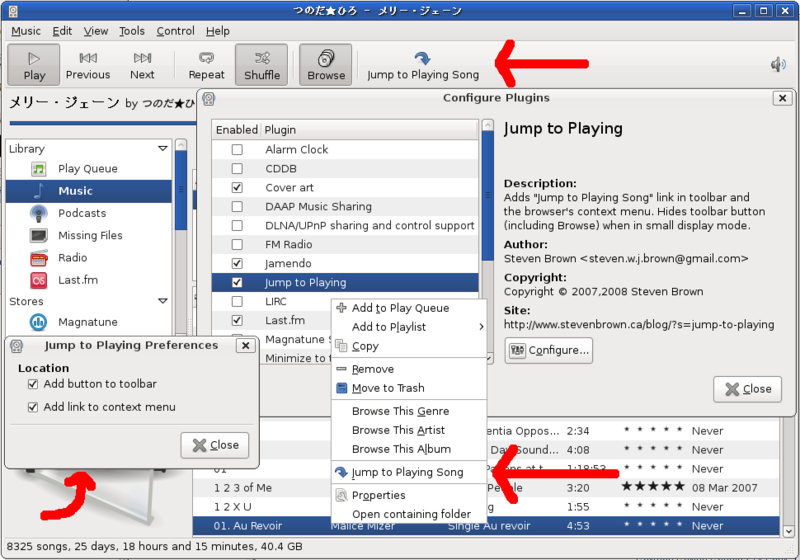 This plugin will display the View : Jump to Playing Song link as a button in the toolbar and/or as link in the Browser’s context menu. Other Rhythmbox plugins can be found here. Using a future version of Rhythmbox – patch here – the menu item will appear in a plugin placeholder, above Properties. Otherwise, it will appear at the bottom, like previous versions. From version 0.3, the Open Folder plugin will also be placed in the plugin placeholder. Just a couple small changes since 0.2. Selecting the context menu option in the preferences will now display the link in PodcastView and PlaylistView popups, as well as BrowserView and QueuePlaylistView. Assuming the patch on bug 557152 is applied, this will place the context menu items in a plugin placeholder and allow the Preferences to remain the last menu item. Grab the Source: bzr branch "http://stevenbrown.ca/src/jump-to-playing/"
Extract the jump-to-playing folder into your ~/.gnome2/rhythmbox/plugins/ directory (or ~/.local/share/rhythmbox/plugins/ directory, if the .gnome2 directory doesn’t exist). Completely replace any previous versions. Update 2008/10/26: Added screenshot, descriptions to screenshots, and link to main plugin page. Update 2008/11/10: Added link to version 0.3.1 and added description. Update 2010/12/08: Added alternative installation directory. Posted on Tuesday, October 21st, 2008 at 11:47 am. Tagged with: Development, Gnome, plugins, Python, rhythmbox, UI. Do you know how i can react to key sequences with python? I asked already in the IRC channel, but it seems that nobofy knows a answer… do you have an idea? If you fix that, then my script should work. Thanks for the script, Brett! I updated your comment to fix the double ampersands. Let me know if there’s anything else. Thanks for a the great plugin. Doesn’t work for me.. I’m on debian wheezy (testing) amd64 and rhythmbox 0.12.8-3. Mbiza, did you try both installation directories? I tried both install directories, but the plugin doesn’t show in Rhythmbox.. I will update here if anything changes. I’m about to write a lyrics plugin for Rhythmbox (one that actually works) and thereby stumbled upon your plugin. I liked the idea and I ported the core functionality to work with the new Rhythmbox 3 (I removed the preference things though).